ASTORIA — For one Queens family, monsters at bedtime aren't necessarily a bad thing — they're a business opportunity. 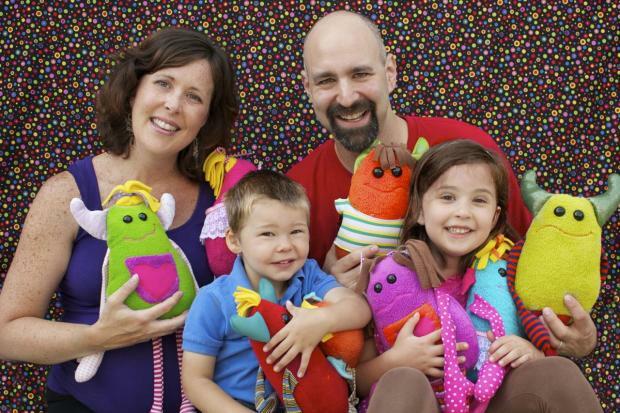 Astoria husband-and-wife team Eric Black and Erin Slattery Black and their three young children are the inventive forces behind Lyla Tov Monsters, a line of handmade plush toy monster dolls that they craft and sell out of their Queens home. The family sells Lyla Tov Monsters online and in select stores and boutiques, but say the demand for the dolls has grown so fast, they can't keep up. So the Blacks recently launched a Kickstarter campaign to raise the funds to turn their at-home business into a full-fledged, factory production. "We've been doing them in our house, doing them one at a time," said Eric Black, who works in children's television production. "We really couldn’t keep up with the demand, and we wanted to distribute wider and hit more stores." The idea for the family business started three years ago when oldest daughter Lyla approached her mom about making a holiday present for dad. "When she was 3 years old she came up to my wife with pictures she drew of a monster and said, 'I want to give this to daddy for Hanukkah,'" recalled Black, who said Lyla, now 6 years old, followed up with another request: "Make it real." So Lyla and Erin Slattery Black — a costume-designer who snagged two Emmy awards for her work on "Sesame Street" — teamed up to turn Lyla's drawing into an adorable real-life plush doll monster, which has served as the prototype for every other doll they've turned out since. A portion of all sales is donated to children's charities that Lyla helps choose. In Hebrew, "lyla tov" means "good night," Black said, making the play-on words the perfect name for the dolls, which are intended to help children get a good night's sleep. "They're good monsters. They're the guardians for kids," Black said. "They keep them safe at night." At the Black home, everyone lends a hand to the the monster-making process. Lyla, the original inventor, helps choose colors and fabrics for each monster design. Quinn, 5, is charged with testing the "huggability," of each doll, and even 2-year-old Tessa helped out on the advertising front by dressing up as one of the monsters for her first Halloween. But demand for the dolls has outgrown the capacity of the family's Astoria home, which is where their Kickstarter campaign comes in. Donors who give to their cause are rewarded with perks, including an invite to a Lyla Tov Monster launch party, the chance to name a monster or to help design one of the creatures. So far, the family has raised more than $16,000, which they plan to use to work with toy production company Beverly Hills Teddy Bear Company to manufacture 2,000 dolls based on two limited-edition designs for one boy monster and one girl monster. And with less than two weeks left to their campaign — the Kickstarter drive runs through July 14 — they're hoping they can raise even more funds to add a Lyla Tov Monster bedtime book to their production plans, and maybe even a third factory-made monster design. "We're really working harder at it now," Black said. "We want to get the money up so we can have more variety."